Go the extra mile, it's never crowded; University Life. 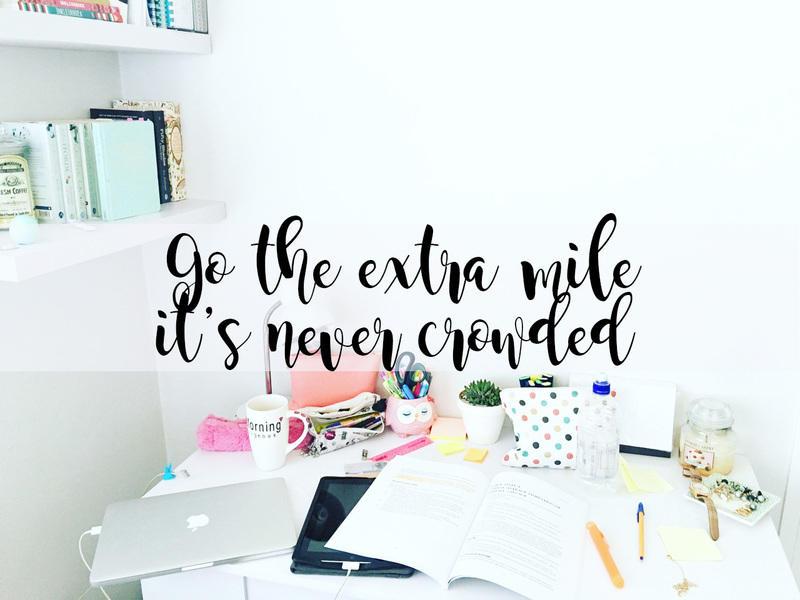 My question for you is, what does going the extra mile mean to you? Does it mean doing something out of the ordinary? Doing something you really don't want to do but it will make you feel better? For me, going the extra mile is going above and beyond of what's expected of you. Pushing yourself to be the best that you can possibly be. In this case, everyone has different dreams, we know this. Everyone has different capabilities too; I am a very organised person, whereas a girl I study with isn't very organised, but she's a very confident speaker. Working harder than what you usually would it's about being competitive against everyone else around you, it's having the personal desire to do more, to be more and to achieve more. Going the extra mile is about being able use your strengths, build relationships around these strengths and spreading just as much positivity as you would spread Nutella on your toast. Not going to lie, it makes you so damn fabulous as well. I personally have found by going above and beyond what is expected of you is a brilliant way of achieving them higher marks. Have you read every single book before your lecture? have you already planned all your notes based on the materials you were given before your lecture? There are so many different ways of pre-planning your notes etc for lectures to make it easier in the long run for you! It also saves trying to take down notes while they talk ridiculously fast. By going above and beyond, you can also benefit from learning more. In this case, finding all the books on your reading list, and reading them before your lectures is a great way of finding out all the information you need to know, so when it comes to starting your essay or project, you know exactly what to put down on your plan. Pushing yourself to be the best you can possibly way also increases the range of things you can experience. For me, I have 100% seen this in University, and as a blogger. If you put your 100% in to something, you will get 100% back out of it. Going above and beyond what's expected of you can actually really inspire other students too. When they see how organised you are and the grades you're getting, this will inspire and motivate them to use your tips to also go that extra mile. This also occurs in the blogger community. We inspire each other and we support each other to be the best version of ourselves. It's not about competing against one another. It's watching each other bloom. I personally believe setting a great example as a student is the best way of being the best you can possibly be. To be able to say that you have inspired and encouraged others not only is an amazing feeling, but it shows everyone that they can do it too, as long as they put in their 100% effort and go that extra mile. To be honest, by going that extra mile, it is never crowded. Make yourself shine. Let me know what "going the extra mile" means to you. This post is so great. Going the extra mile does come with its rewards too! You feel better about yourself and you help others! Could'n't agree more! Really good tips. You get back what you put it - definitely! !